The importance of telling what's happening on the ground and relaying these visuals back to the people with the power to make a difference and fund the response is so critical. Editor's note: Over the next few weeks, we at IDA will be introducing our community to the films that have been honored by the Academy of Motion Picture Arts and Sciences with an Oscar® nomination in the documentary category. You can see Body Team 12 on Saturday, February 27 at 11 a.m. at the Writers Guild of Theater in Beverly Hills as part of DocuDay LA. 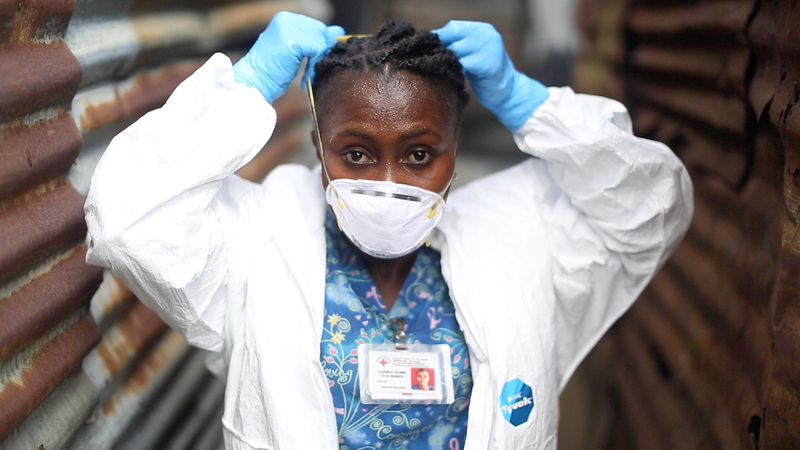 In 2014, when the Ebola virus outbreak began to spread across West Africa at an unprecedented rate, the Red Cross recognized the need to establish an entirely new kind of job. In counrties like Liberia where the outbreak was at its most extreme, body teams were organized and tasked with safely collecting Ebola victims from villages and neighborhoods throughout the region. What could be considered the most gruesome and life-threatening job in the world is depicted in David Darg's short documentary film Body Team 12 through the experiences of one body team as they travel from house to house with the arduous task of convincing families to release the bodies of their loved ones for a safe burial. At the front of this team is Garmai Sumo, a mother whose feminine experience makes her the perfect candidate for negotiating this safe method of body collection with grieving families. We spoke with Darg over the phone from his home in New York City about what this Oscar nomination means for humanitarian efforts everywhere, and why his wife was so mad at him when she saw the footage from Liberia. Body Team 12 is an interesting companion piece to your first documentary, Sun City Picture House, about a Haitian man who works to build the only movie theater in his home nation after the 2010 earthquake. You seem to have a knack for traveling to crisis areas and honing in on these most human of experiences. What drives you to tell these stories? All of these films do have a common theme in that they are borne out of disasters that we've responded to. We get involved in a lot of humanitarian work, so we're there as relief workers and humanitarians in these different places. Sun City Picture House came out of Haiti, as did our film after that, Baseball in a Time of Cholera. 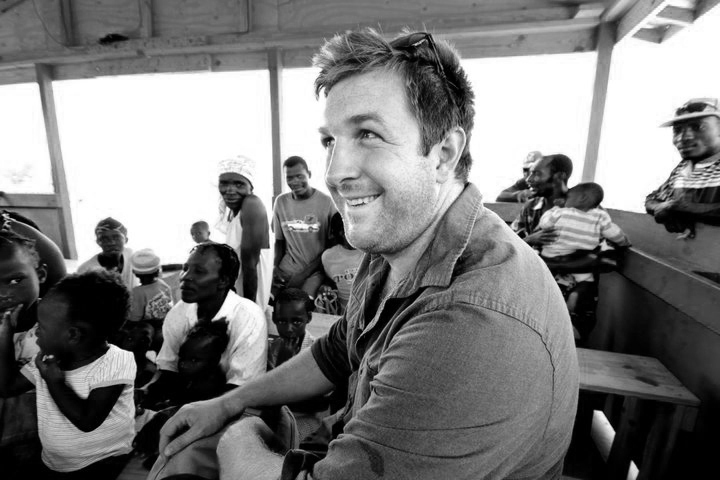 When Ebola started, I went to Liberia early on in the outbreak to see what I could do as part of the relief effort. Of course, the whole time [I was] shooting, my goal [was to produce] content for awareness back home and for fundraising. So I started to shoot a lot of what I was seeing, but, as always, I was on the lookout for one particular story that really stood out. When I came across the body teams, it was so obvious to me that that needed to be our story. At the time, during the height of the outbreak, the visuals we were seeing in the media in the West were of these people wearing yellow, protective suits with goggles and masks on, doing this incredibly dangerous work. But nothing was being told about who these people were. A lot of media outlets who cover your film paint you as an aid worker first and a filmmaker second. Which title do you prefer? How would you rather be remembered? That's a really good question. In my mind, and in [producer] Bryn [Mooser]'s mind too, the two are so married together in the work that we do that neither trumps the other. The importance of storytelling and filmmaking is so critical to humanitarian work that [it] couldn't exist without the storytelling component. The importance of telling what's happening on the ground and relaying these visuals back to the people with the power to make a difference and fund the response is so critical. We see filmmaking as a critical component of aid work. It really doesn't bother me which title I'm attached to, but I would say that a combination of the two is probably the best way to describe who I am and who Bryn is. I would say that we are humanitarian filmmakers. So you went to Liberia attached the Red Cross? I went to Liberia initially with a US organization called Operation Blessing, who were involved in the manufacture of a disinfectant solution that was widely used to fight Ebola, like a liquid chlorine. So I was involved in a lot of logistics in importing electronic equipment to make chlorine and helping set up local Liberian teams to distribute and manufacture it. That's what led me to interacting with the body teams. 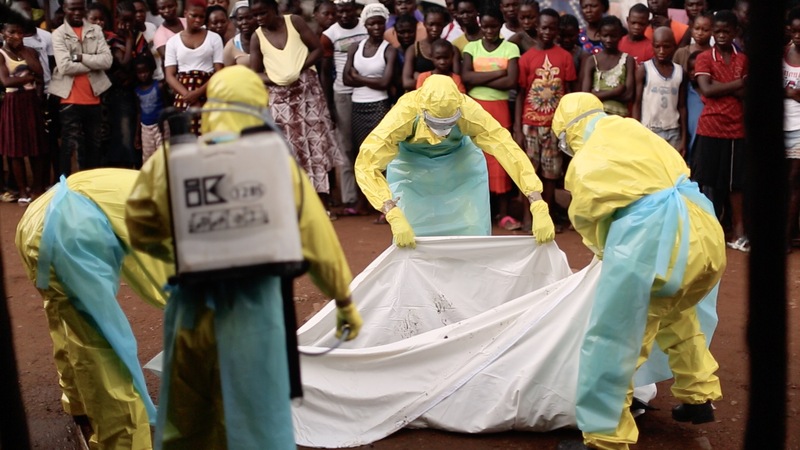 The body teams themselves are coordinated by the Liberian Red Cross. When you got there, you didn't know that you would be embedded with a body team? I shot the film over the course of four trips to Liberia during the outbreak, two of which were right at the height of the outbreak when it was most critical. It wasn't until the second trip. I saw the work of the teams during my first trip, so I arranged that on my second trip I would embed with one of the teams. They agreed and assigned me, randomly, to Body Team 12. They were the 12th of 12 teams working in the capital city of Monrovia. There are lots of teams in the region, and in every country they had teams all over the place in the major cities. The first day I showed up at the headquarters they said, "OK, today you're going out with Team 12." I joined them, and I didn't expect to meet someone as powerful or as captivating as Garmai; I also didn't expect to meet a female who was that strong a character. As it turns out, it's a policy of the Red Cross that every team has to have a female member because they make the best negotiators when it comes to convincing the family to release the dead relative. What was it about Garmai that put her in the center of the story? Why is it important, in your mind, that she's a woman? She definitely found me. The goal was to tell the story of the bravery of these body workers, that they would be willing to potentially sacrifice their lives for the sake of saving their countrymen. When I met Garmai in the field, she really struck me as the strongest of the characters on the team. I was really intrigued by her story; not only was she able to endure the mental and physical dangers of the job, but also she was a mother with a young child, and because of the stigma associated with the outbreak, she'd been ostracized by friends and family and her neighbors. Everything that she was going through really astonished me, that anyone could stick with the job. It was really clear that she'd be an excellent character to tell the story through. That's similar with a lot of our previous films, that they're really character-driven and that we find someone among these disasters and crises who has a powerful perspective, and we tell the story through an individual's eyes. Have you followed up with Garmai since you finished filming? We're friends on Facebook and we communicate all the time. The day of the nomination she was screaming on the other end of the phone. And of course she's seen lots of articles popping up on Facebook. It's really great for her to see that the story is going to be able to inspire many more because of the nomination. We keep in touch with her because her role has shifted. Now that Ebola has been declared officially over by the World Health Organization, there's no need for the body teams. But she's still involved in the relief effort because the legacy of Ebola is that there's an epidemic of orphans who lost both parents. She was there at the moment that their parents were taken away, so she had a database of all addresses in Monrovia where there are orphans. Now she's helping to care for around 300 kids in a program that's providing them scholarships, food and medical care. Were you at all concerned with the risks you were taking with your own health in embedding with a body team? What were some precautions you took? It was really concerning. There were people dying all around us from this invisible killer. People weren't sure if they were going to be next. Obviously, being with the body teams made it exponentially more dangerous because we were face to face with Ebola victims. It was very nerve-wracking, probably the most dangerous film that I've been involved in. The first day I embedded with the team, the advice that the Red Cross gave me was to maintain what they called "a safe distance," and wear long sleeves and rubber boots. I did that, and got back to my place at the end of the day, and really struggled with the anxiety of not knowing if I had been contaminated that day. I had a headache and I felt fatigued, and both of those are the initial symptoms of Ebola. On subsequent outings, I also realized that I wanted to get closer to the action for the sake of the film, and so I wore a white, full body suit, gloves, mask and goggles for several of the scenes in the film where I'm really close to the action. It was a really difficult film to produce in that sense because I got to experience a glimpse of the anxiety that the body teams did on a daily basis. I would get back at the end of every day not sure if I'd been exposed; medical professionals were dying almost on a daily basis around us, and these were people who were taking similar precautions. So It was very taxing mentally and physically. Again, the film was made as a tribute to the brave, young Liberians who were willing to put themselves in that situation on a daily basis, month after month, and somehow endure that level of physical and mental hardship. It's really exciting for us to think that this film can help inspire others through that story. Human history is defined by these brave individuals who are willing to stand up against all the odds and do this incredibly dangerous work for the sake of others. So that's really the message we're trying to convey with the film. I read that you were in quarantine during the editing process. Tell me what that was like. It wasn't as dramatic as being in a bio-container on my own. For two of the trips I made, the CDC had mandated mandatory monitoring for anyone returning from the three countries in Africa that were affected. When I arrived back in the States, I had to check in with the CDC twice a day, monitoring my temperature and going through a checklist of symptoms to make sure they could catch any early symptoms. While it wasn't a mandatory quarantine, I was advised by the CDC to not go out in public as much as I could. At the time, there were stories of foreign journalists returning to the US and being caught out and about in New York and losing their jobs. It was a huge deal. For the sake of not being on the news, I decided to stay at home for 21 days. I would talk to a CDC nurse twice a day. It was convenient because I'm notorious for always being on the move, so Bryn really appreciated having me in one place, with zero excuse to not start editing the film. Would you take a risk like this again, for the sake of telling another story? I would have to say yes. For me, I feel as though the risk was worth it because had I not taken it, this story, which I feel is extremely important, wouldn't have been told. I think it's important that filmmakers are willing to take certain levels of risk, and we see that a lot in documentary. Some of the best docs of recent years have been by filmmakers who are willing to take exceptional risks. So if you ask my wife, she'd probably tell you that I shouldn't ever take that risk again. And it's funny because she didn't realize how close I was getting to the action until she saw the first cut of the film. And then she was really mad at me. For about 24 hours she wouldn't talk to me. The film has had a pretty good life -- it premiered at the Tribeca Film Festival, which is where your first film premiered. What's it like to have such a strong champion in such a huge festival? How has that helped the film on the road to Oscar for you? We've really appreciated the support from Tribeca since our first film, Sun City Picture House. Sharon Badal and Ben Thompson have become dear friends and have been kind enough to program four films at Tribeca. As filmmakers we've evolved over the years, and with the support of Tribeca we have helped to learn the industry and learn strategy in the industry in order to help give these films a bigger audience every time. Winning Tribeca last year was huge for us and huge for the film, and it's been really incredible to see the exponential platform that's given this story. After Tribeca, we got picked up by HBO; it's going to air in March. And then of course, qualifying for the Academy Award through the Tribeca win really helped to propel us on the journey to where we are now. It's really been incredible to see how far we've come from Sun City Picture House, and a lot that success is due to the incredible support we've received from Tribeca. After the Oscars whirlwind is over, what's next for you? There's always so much going on at our production company, Ryot. We have a full news platform, so we're constantly working on [delivering] short-form storytelling to our audience of young people who really want to engage and help take action on a lot of social issues around the world. I'm continuing to do a lot of reporting and storytelling through Ryot, as well as looking at some more short films that are currently in the pipeline. We've been digging in a lot on the refugee crisis over the last year. I just returned from Greece a couple of weeks ago, where we've started production on not only traditional form documentary, but also virtual reality storytelling. You can download our app at the App store. We've shot in almost 30 countries in the last year in virtual reality, and we're really excited about that medium. As a company, we've been doing a lot of investment into equipment and sending crews out to do storytelling in virtual reality. As I said, the refugee crisis is going to occupy a lot of our time over the next few months. After that we're going to have to wait and see what develops. Katharine Relth is the Communications Manager for the IDA.